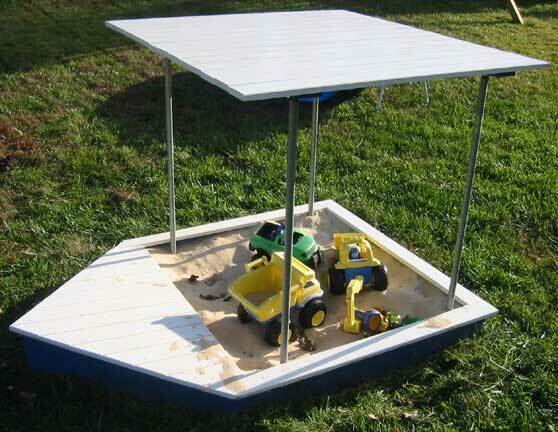 We had been looking at various outdoor sandboxes for our son to play in and liked the boat design ones. However, they were very expensive (>$200). So I designed my own. Basic construction is out of white-wood from Home Depot painted with several coats of exterior-grade paint. Interior dimensions are approximately 42"x42". Most of the top surfaces are white, while the sides of the boat are blue as well as the under-side of the top. 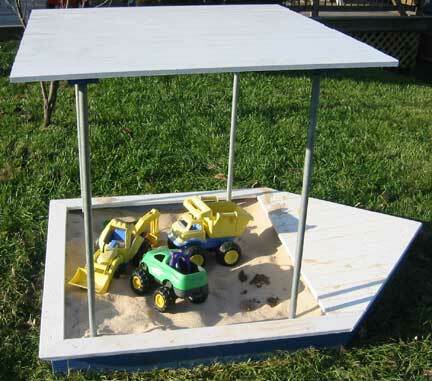 The bottom is opened to the ground to allow water to drain out of the sand after a rain (or a bucket of water). The top is a separate piece supported by 1/2" diameter galvanized pipes driven into the ground. The deck is turned to provide shade to people sitting up front playing. A child up to about 36" tall can stand up straight under the top.